The We Do Construction Set (Lego set 9580) enables students to build and program simple LEGO models that are plugged into a computer. 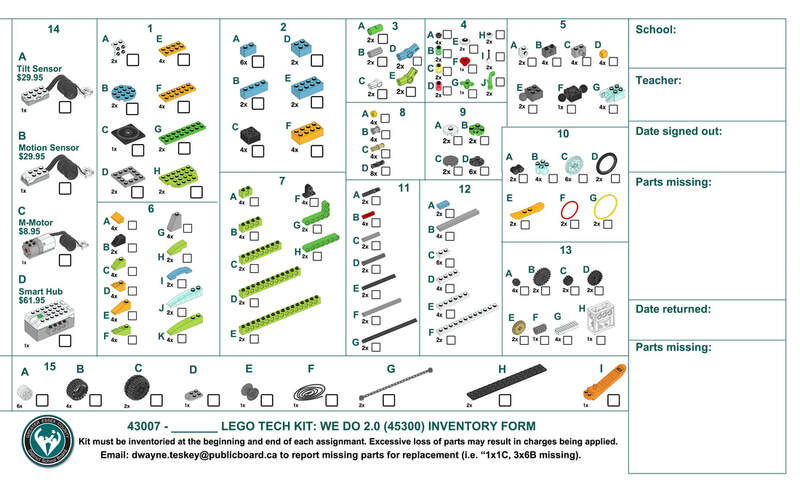 The set contains more than 150 elements, including a motor, motion and tilt sensors, and the LEGO USB Hub. Combine with the Software and Activity Pack to carry out 12 theme-based activities. Extra kits can be booked by contacting Fouada.Hamzeh@publicboard.ca. This core set (Lego 45544) is optimized for classroom use and contains all you need to teach using the LEGO® MINDSTORMS® set. It enables students to build, program and test their solutions based on real life robotics technology. The We Do 2.0 Core Set (Click to Book) (Lego set 45300) features wireless technology, a built-in documentation tool along with assessment rubrics and a design library full of ideas and inspiration for creating solutions to projects. The core Set features a programmable SmartHub, enhanced motors and sensors. LEGO We Do 2.0 uses Bluetooth. Each kit requires 2 AA batteries, not included.